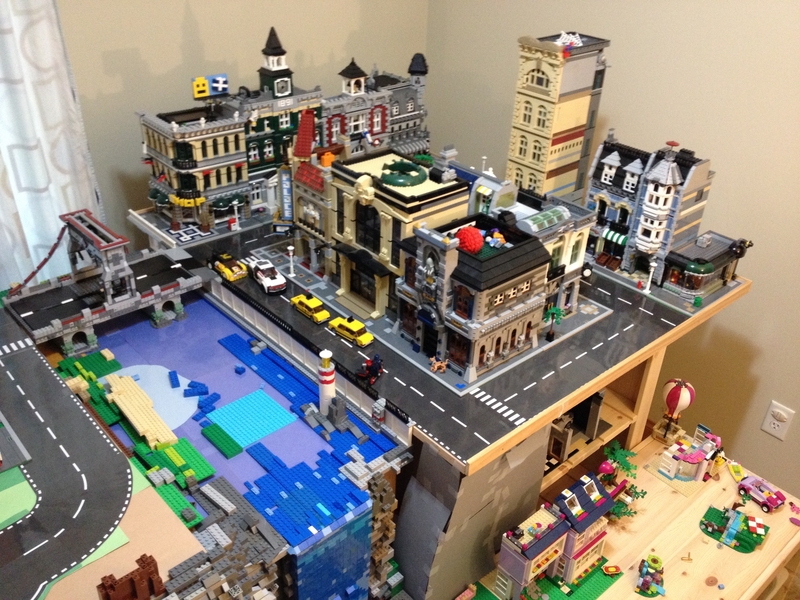 so I'm starting to think about creating my own town/lego city mainly with my modular buildings to start with. I was wondering what do most people display these on, it will be in a sore room so was thinking a trestle table? I use plastic paste tables I got from Wilkinsons which work reasonably well and are not to costly although there is some droop in the middle of maybe 0.5-1cm drop compared to the ends. 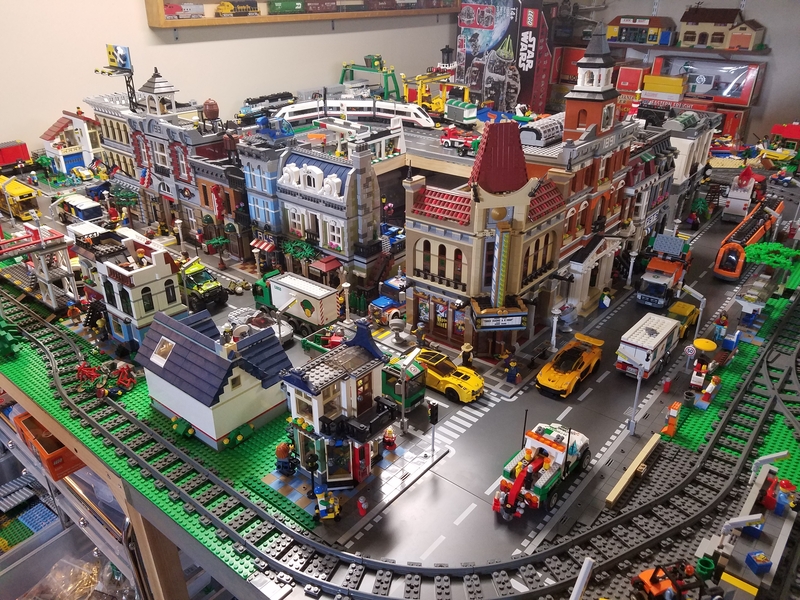 The good thing is i could get more than i needed initially so can expand the town easily and maintain a consistent height but without taking up to much space as they store folded. 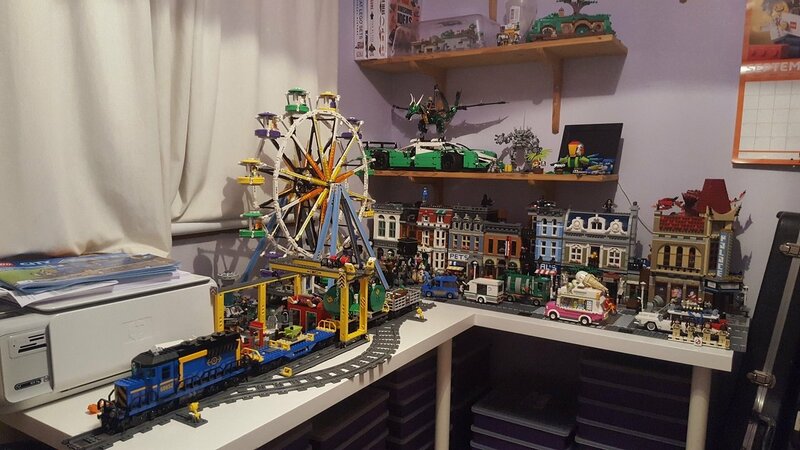 I don't have space for a full city in my study, but I do have a couple of IKEA Linnmon tables, set at right angles to each other, which have enough room for a street of modulars and other bits and pieces. Obviously, you can add as many as you need. While they are cheap, relatively speaking, if you do need a huge amount of table space, you may find it better to go with trestle tables of some kind, but they won't be as sturdy. The 200x60cm table with legs is £39, but I went for a 100x60cm (£15) and a 120x60cm (£25) table. 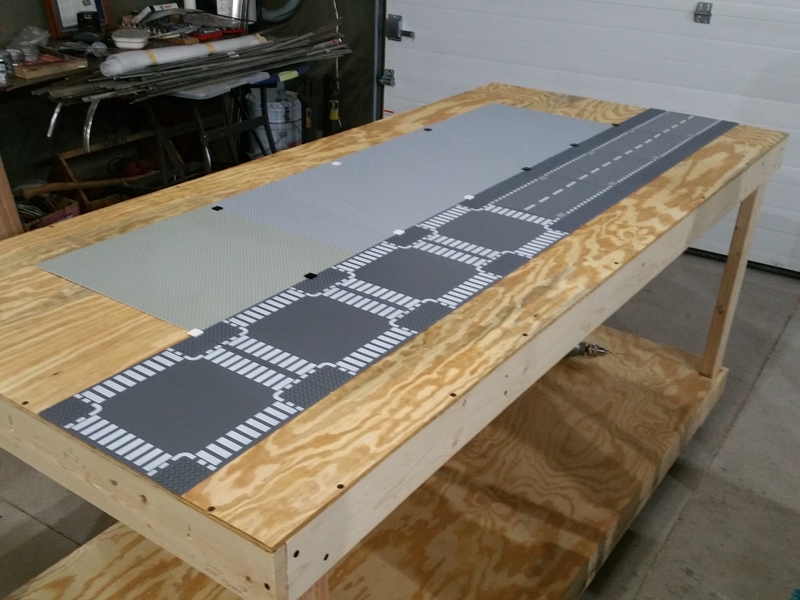 I built two 8-plate by 3.5-plate tables with ample storage. Expect to invest in lots of roadplates. And don't forget to account for the necessary gaps between the baseplates! Thanks - these look ideal. At the time - and for spacing purposes, I only had four packs of roadplates. Now I have way too many four-way roadplates. I gave up on the official baseplates. They were limiting my layout too much. 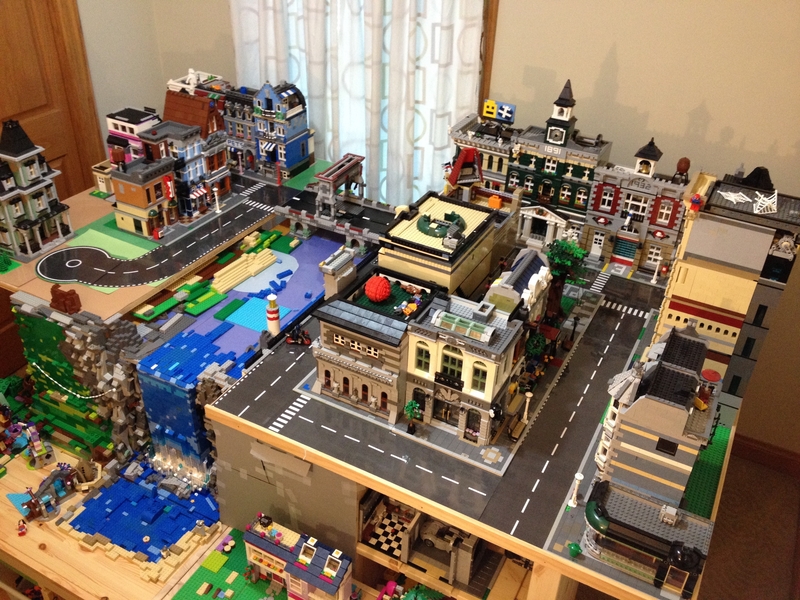 I started to do brickbuilt roads but gave up on that idea when I realized how much money it would cost. I thought about painting roads but I knew I wouldn't get them to look right. Then I thought I'd try construction paper. 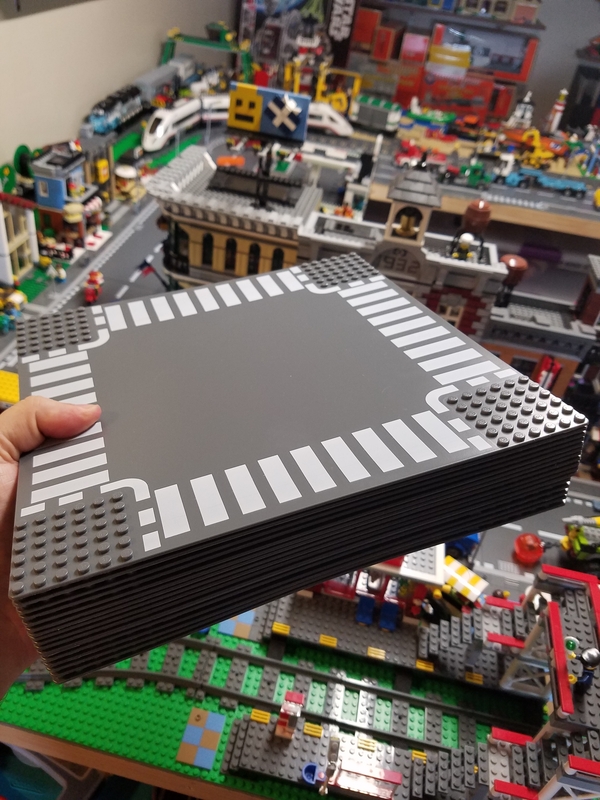 Googling Paper Lego Roads revealed my idea was not unique. 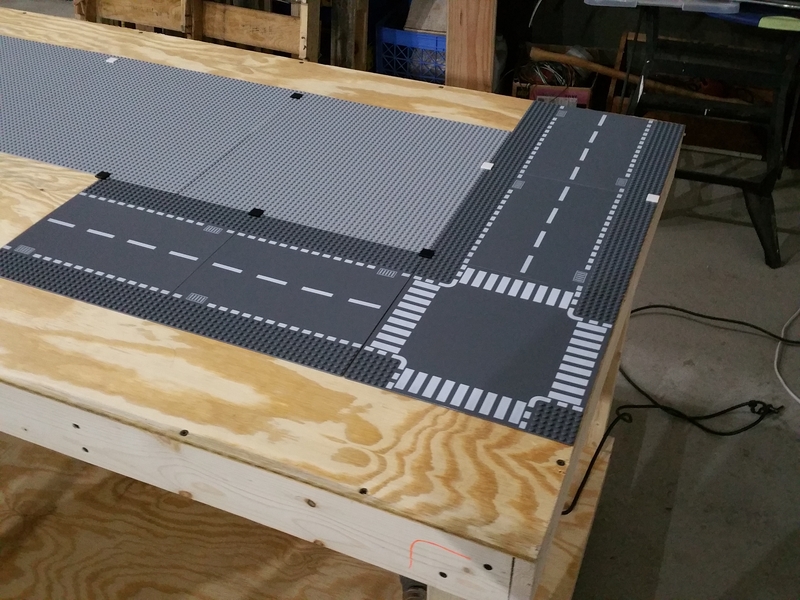 I also found a PDF with printable roads. The paper on it's own wasn't right, a cheap laminator helped. I'm actually really satisfied with the look. Here is an early (poorly photographed) look at my in process city. ^ Those roads look great! I like that idea a lot. How do they stay in place? Are they glued? ^ They're just slid under the buildings so far. I plan to tape them in place once I get a little further in my project. At one time they actually sold two straight roads in one pack. I will never know why they combined two different plates in one pack. 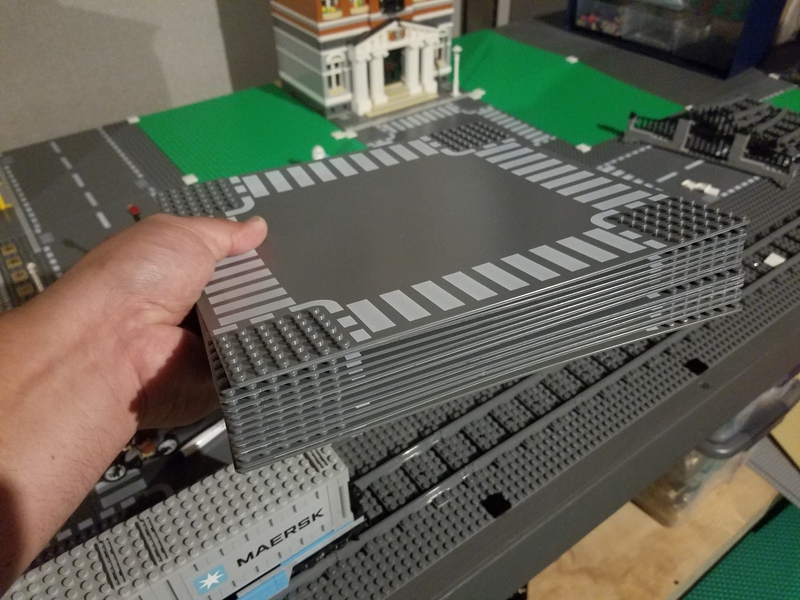 @Thoughtsonblocks - Hmm, I see your schwartz er... stack is thicker than mine. I suppose there is a first time for everything. "At one time they actually sold two straight roads in one pack. I will never know why they combined two different plates in one pack." So that they could sell more packs to people who wanted more straight sections. And so that people who only wanted a Straight and a Cross Road section only had to buy one pack. Yup. Selling just straights is great, but they would sell far fewer crossroads. Maybe so few that it isn't worth their time to make. Bundle the desirable straight with an unwanted crossroad, and that problem goes away. yes they started in 2002 sets number 4108, 4109, 4110, 4111 and they got green suround. Current one start selling in 2005 which is long time compared the previous. Is it sacrilege that I've actually painted a bit of road onto the one table we have? I was intending to do the rest because I'd rather spend the budget on bricks than wasted road intersections. I'll see if I can get in the shed and take a photo. I thought it looked ok the only downside is the small 'step' off the building plates but I was going to make a lot of sidewalk and then it would look like a pavement edge.